We have various non-woven for diapers, hygiene products, cosmetics, and medical products complying with the different customers' specifications. 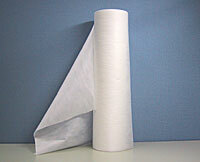 The natural fiber is manufactured by water jet. The cotton spunlace is 100% natural, and soft so it prevents skin irritation. We believe that the environmental assessment makes your company's image good. It is possible to put your company's logo or original pattern on the material by water jet.